What luck to have snow. I live in the North of the UK and have only had a couple of frosts all year - global warming in action. Good luck with your blog - it's really lovely. Would posting a comment contradict 'wordless Wednesday'? I just wanted to say great pic and ask what plant is that? LOL! I was feeling wordless on Wednesday, but yes, of course, comments are always allowed. 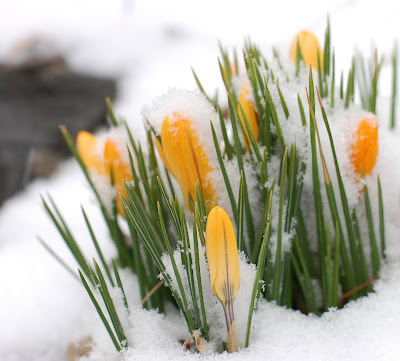 Those are crocus flowers, covered in yesterday's snow.